This was the show of the year, especially for anyone with a taste for anguish, loathing, abjection and squalor, both physical and psychological. But Francis Bacon made all those things as irresistible as Monet water lilies. After the mass sufferings of World War II, he utterly reconceived the body by submitting it to unbearable pressure, squeezing the flesh, smearing it and letting it suffer the wounds of social and sexual combat. 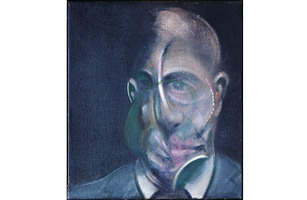 Seventeen years after his death, Bacon's paintings look more and more like the 20th century's most deadly accurate representations of the basic human predicament.